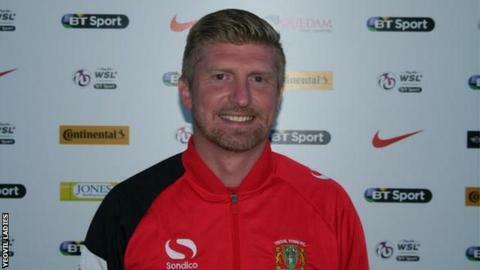 Yeovil Ladies have named Jamie Sherwood as their manager on a full-time basis. Sherwood, who previously managed Cardiff, came to the Women's Super League Two club as assistant to Sarah Lawler in the summer. He was put in temporary charge of the first-team following Lawler's departure last month and, after six games, he has now been given the job permanently. His appointment comes after his wife, Yeovil midfielder Katie, announced her retirement from playing. The Wales international made her final appearance and scored for the Lady Glovers in their 2-1 defeat by Sunderland Ladies on Sunday, and will now concentrate on her career as a primary school teacher. Speaking about taking on the manager's role full-time, Jamie told BBC Somerset: "With Sarah moving on to pastures new, it gave me the opportunity for me to come in and stake a claim. "The girls have done me proud over the last six games and the club have decided to give me the position. I'll give it everything I've got." Under their new manager, Yeovil Ladies have taken 10 points from six games and are currently fifth in the league with four games of the season left to play. Lawler announced her departure on 1 August after opting to take a job as a development coach with the Football Association.